Watermelon jelly makes this breakfast trifle even more trifley, but it's just as delicious with cubes of fresh watermelon instead if you want a much quicker option. 1. To make the watermelon jelly, puree the watermelon flesh and strain. Whisk gelatin and boiling water until smooth and whisk into watermelon puree. Strain again into a mould, and refrigerate until set. 2. To make the raspberry sauce, gently heat 100g raspberries with 1 tbsp icing sugar, push through a sieve, discarding pulp, and refrigerate until needed. 3. To make the yoghurt cream, whisk the yoghurt with remaining icing sugar and vanilla. 4. 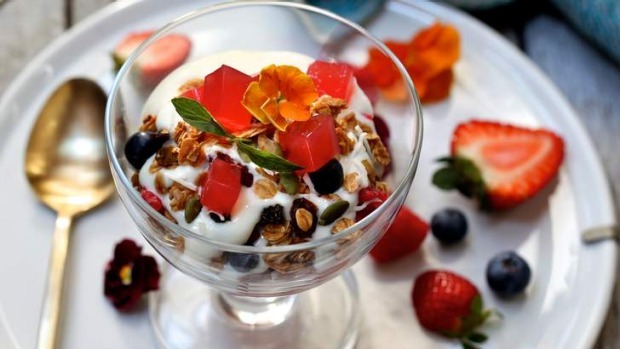 To serve, layer the jelly, berry sauce, yoghurt cream and granola in wide glasses or glass bowls, repeating the layers to your own satisfaction. If you like, scatter with unsprayed edible flowers such as nasturtiums or heart's ease.